Zimbabwe's opposition says its candidate, Nelson Chamisa, has won Monday's presidential election. The MDC Alliance says the ruling Zanu-PF party is attempting to rig the vote to allow President Emmerson Mnangagwa to win, and the delay in releasing official results is unacceptable. The election commission has said there has been no cheating and it needed time to collate the votes. The polls were the first since long-serving ruler Robert Mugabe was ousted. The vote attracted a high turnout of 70% and was monitored by international observers. Speaking at a press conference in the capital, Harare, the MDC Alliance's Tendai Biti said there was a clear attempt by Zanu-PF to interfere "with the people's will". He warned the party not to "plunge Zimbabwe into chaos". Can post-Mugabe vote heal divisions? A Zanu-PF spokesman told the BBC he had "no clue" what Biti was talking about. The party, which has been in power since independence in 1980, has been accused of rigging previous elections to keep Mugabe in office. What's been the reaction on the streets? There have been celebratory scenes outside the MDC Alliance headquarters in Harare. Crowds have been singing and dancing since Biti said that Chamisa had won. A truckload of policemen and water cannons also drove near the building in an apparent show of force. However, many businesses reopened on Tuesday after being shut on voting day, a public holiday. When will we know the official winner? The Zimbabwe Electoral Commission (Zec) has until Saturday to announce the results but its chairwoman, Priscilla Chigumba, said she expects the announcement to be made well within that deadline. "We will not subvert [the people's will]," she said at a press conference, rejecting allegations that there was rigging. Observers say the race between Mnangagwa's Zanu-PF party and Chamisa's MDC Alliance is extremely tight. Both men are among 23 candidates running for president. Zec has announced some of the results in the parliamentary elections but says it needs time to pull together the figures for the presidential poll from across the country. A presidential candidate needs more than 50% of the vote to win outright. Otherwise, a run-off election will be held on 8 September. In a tweet, Mnangagwa expressed confidence that he will win but added that he was "waiting patiently for official results as per the constitution". Known as "the crocodile" because of his political shrewdness - his party faction is known as "Lacoste"
Survived several alleged assassination attempts, blamed on supporters of ex-President Mugabe. Has promised to rebuild the country's devastated economy, but has been criticised for making extravagant promises - such as the introduction of a high-speed bullet train and bringing the Olympics to Zimbabwe. What are foreign observers saying? European Union (EU) and US election monitors have been allowed into the country for the first time in 16 years to assess whether the elections are free and fair. EU chief observer Elmar Brok said on Monday it was too soon to make a judgement but voting had been "very smooth" in some areas and "totally disorganised" in other areas, Reuters news agency quoted him as saying. "There are shortcomings that we have to check. We don't know yet whether it was a pattern or whether it was a question of bad organisation in certain polling stations," Brok told the AFP new agency. 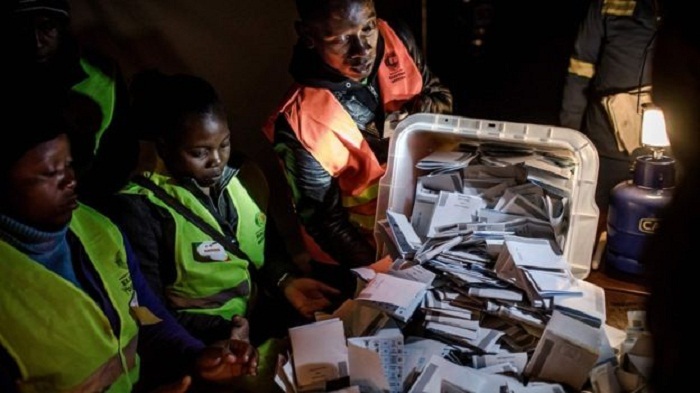 As well as worries about the voters' roll, the opposition has expressed concern over the security of ballot papers and voter intimidation in mainly rural areas. Liberia's former President Ellen Johnson Sirleaf, who was monitoring the poll on behalf of the US-based National Democratic Institute, told the BBC that Monday's long queues showed Zimbabweans were enthusiastic about voting, without any kind of repression. "I think this is an exciting moment for Zimbabweans to change the course of their country through their votes," she told the BBC.